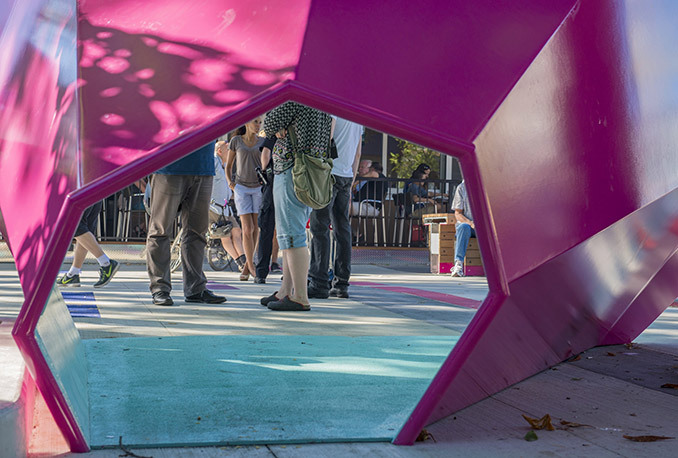 Hapa designed and coordinated the fabrication of a commemorative speakers’ corner feature located in the heart of Vancouver’s West End. 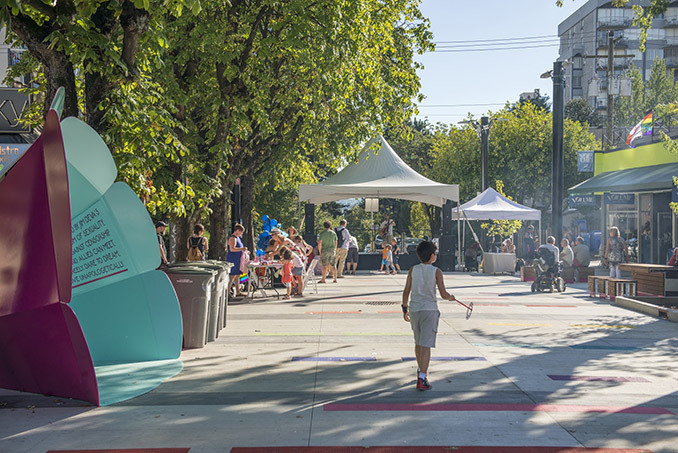 The plaza, commissioned separately by the City of Vancouver, is a street conversion that connects the commercial activity of Davie Street to the residential stretch of Bute Street. 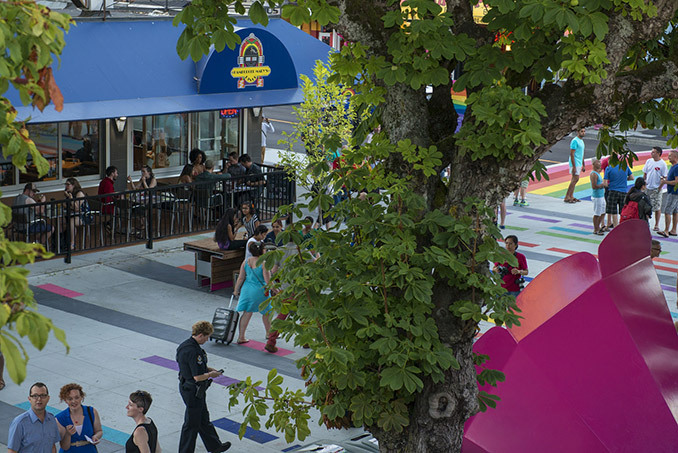 The commemorative sculpture pays tribute to the plaza’s namesake, Jim Deva, who was a beloved community member, a highly respected West End business owner and vocal advocate for free speech rights and equality in Vancouver’s LGBTQ2+ community. 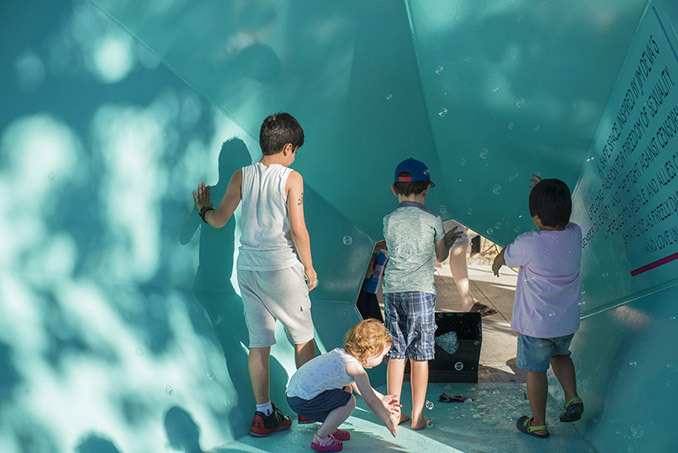 Inspired by the formal geometries of megaphones, gramophones, and flowers, the piece functions as a stage, a soapbox, an amplifier, a bubble machine and an umbrella, and has instantly become the signature of the plaza. 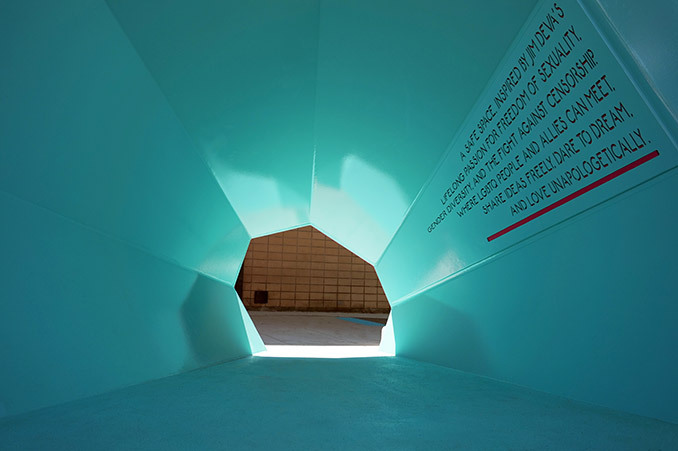 The pink and turquoise colours represent the concepts of sexuality and art, which were included but ultimately removed from the rainbow flag emblem of the gay community. The plaza also celebrates Jim Deva’s role as advocate for parks and open space in Vancouver, making the Jim Deva Plaza conversion — from street to plaza — a fitting dedication. A safe space inspired by Jim Deva’s lifelong passion for freedom of sexuality, gender diversity, and the fight against censorship. Where LGBTQ(+) people and allies can meet, share ideas freely, dare to dream, and love unapologetically.